Lisa Jewell is one of my favourite contemporary women’s authors and I have loved reading all of her books. 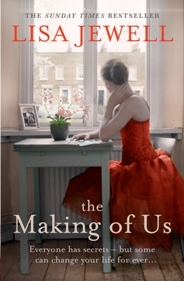 Her latest, The Making of Us is just as readable and compelling as all of the others, and I was hooked in to the absorbing storyline from the very first page. The Making of Us is about a set of disparate people who have never met but who are intrinsically linked by a twist of fate – they all share the same father. This would not be so unusual were it not for the fact that their mothers had never met their father either; the reason for this being that they were all conceived through sperm donation. Their father, Daniel Blanchard was a French medical student who had his own reasons for making the donation and never intended to ever meet his children. However, almost thirty years later, Daniel is dying and asks his friend, Maggie, to help him make contact. At the same time, Lydia, Dean and Robyn are all at crisis points in their lives for different reasons, and all make the decisions to contact potential brothers or sisters through the donor sibling registry that now exists. They ultimately meet and get to know each other and what follows is a heart warming and poignant narrative as these three characters start to come to terms with who they really are and also start to learn about the special relationships that can be enjoyed by siblings. But what of their father. Will they want a relationship with him as well, and even if they do – will it be too late? As with all of Lisa Jewell’s books, the characters in The Making of Us are very sympathetic and also very real. I really liked Dean, Lydia and Robyn and really felt for them as the details of their lives were revealed little by little. I also loved reading of how their relationships with each other developed and there were moments that made me laugh as well as others that had me reaching for the tissues. The Making of Us is also a book that makes you think – about the many issues that are involved within the field of sperm donation. I think that some of the questions raised by and the emotions felt by the three main characters help to explore the issues very well. As you can probably tell, I really loved reading The Making of Us and hardly wanted the book to finish. I will be eagerly anticipating Lisa Jewell’s next offering and hope that it will not be too long a wait! No Comments on "The Making of Us"